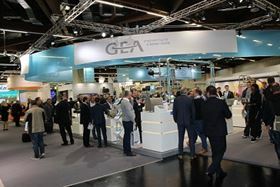 Delegates at the GEA stand at BrauBeviale 2016. One of the most important European trade fairs for production and marketing of beer and soft drinks, BrauBeviale took place in Nuremberg, Germany from 8 – 10 November. GEA presented this year’s new products for the beverage business along with its new technologies. In close collaboration with the beverage industry, GEA mechanical engineers and process technicians create tailored solutions for customers. Among the highlights this year was the DI-BATCH-F batch mixing system with new recipe management which processes dry substances and liquids to a finished syrup or finished beverage. A special feature of this system is its partial discharge from packing drums by means of a drum pump and a hopper tank on weight cells. In addition the GEA “Plug & Brew” skids with centrifuge for craft beer created a lot of interest among customers. These compact units are multifunctional and rated for outputs of 1,000 to 100,000 hectoliters per annum. With the centrifuge skid, the craft brewer can save 30% production time with dry hopping, and can increase yield by up to 10%. Since last year, GEA has reorganized its hygienic pump range, and has combined them in the SMARTPUMP line for standard configurations, as well as in the VARIPUMP line. The Varipump models, optimized for demanding applications such as in biotechnology, pharmaceuticals, and the dairy business, offer maximum flexibility in use. These pumps have an excellent surface finish and a complete absence of pores in the product contact area. The result of intensive collaboration is the new GEA Hilge HYGIA range.